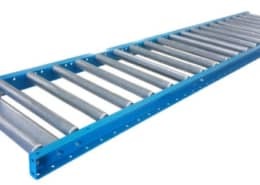 What is a gravity roller conveyor and how does it work? 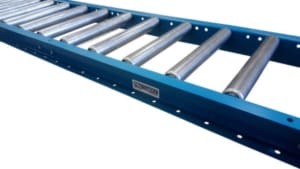 Gravity conveyors, also known as roller conveyors, are among the simplest, most economical and most versatile types of conveyors. They work by allowing the product to roll along the upper surface. These work well when mounted on a slight decline, as parts automatically move across the conveyor. They are used in most types of industrial facilities to help reduce the manual labor of carrying boxes by hand. 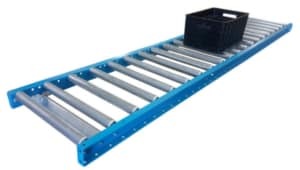 This makes them indispensable in warehouses, production facilities, distribution centers and any other facility in which boxes or crates are handled. 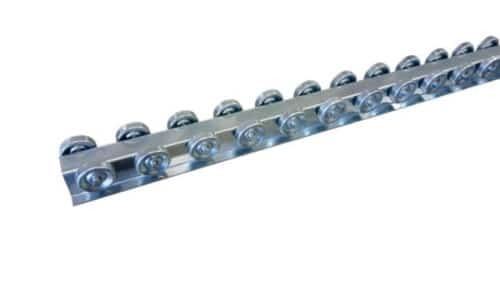 Although most rollers for gravity roller conveyor systems range from a diameter of 1.4 inches to 1.9 inches, 2.5-inch and 3.5-inch diameters also are available for extreme-duty applications. It’s easy to configure your system and buy online. 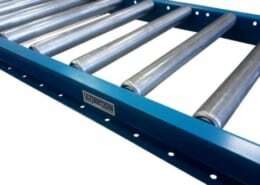 Because of their lightweight, you can use gravity roller conveyors for either temporary or permanent installations. In addition, either permanent floor supports or temporary tripod-style stands are available. Contact our staff, and we will analyze your gravity roller conveyor needs and configure a system for you. 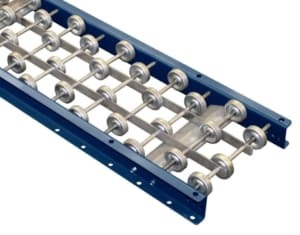 Most commonly known in the industry as gravity conveyors, they are also called roller conveyors, gravity roller conveyors, roller conveyor tables or roller conveyor frames. All of these descriptions refer to a simple system as shown in the image below. Required diameter of the rollers (standard diameters are 1.4”, 1.9”, 2.5” and 3.5”) – Although larger rollers can carry more weight, they are more expensive. 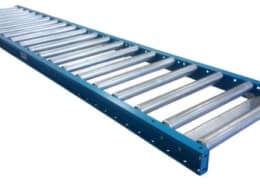 Frame style (generally powder coated steel; aluminum frames and rollers available on some models) – Generally steel is used unless a lighter weight is very important. 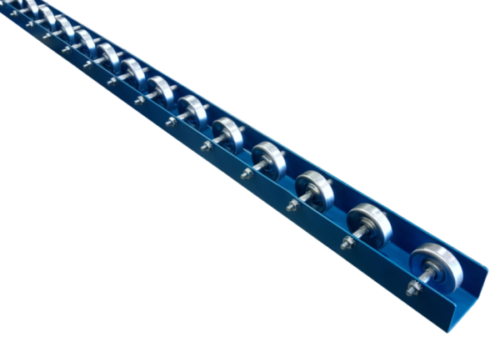 Length of each conveyor or roller table section – Choose from 5-, 8- or 10-foot sections for most roller conveyors. Longer sections are more economical per foot but can cost more for shipping. 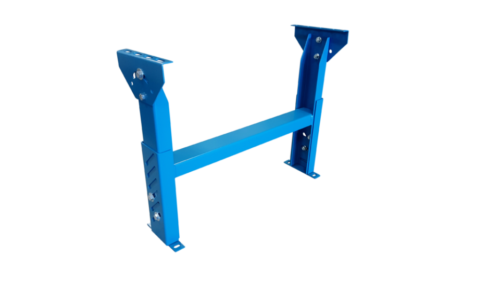 Longer spans such as 10-foot sections may also need a center support or leg stand. 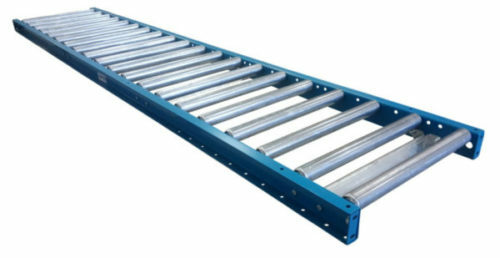 The width of the conveyor – This is generally measured as the distance between the two conveyor frames. What sizes of Gravity Roller Conveyor are available and how do I choose one? Choose the gravity roller conveyor width you need based on the product dimensions. Allow at least 1 inch on each side. 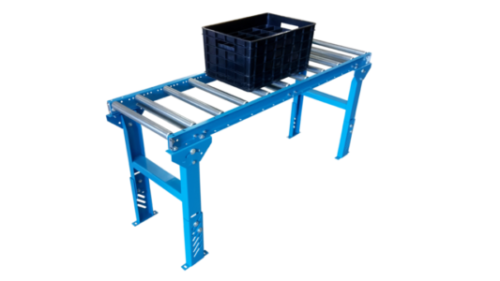 Also, consider wider widths or fixed or adjustable side guides (optional) if the product may move sideways on the conveyor. 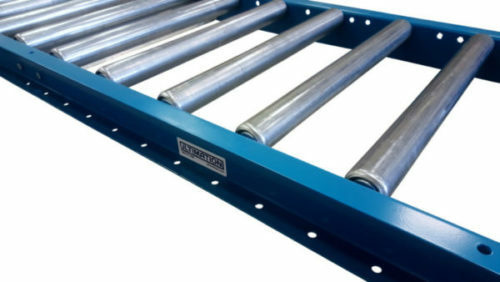 Decide on the length of the roller table you need. Lengths of 5 or 10 feet can easily be joined together with curved sections to achieve the layout required. Check the load rating table that shows the load capacity of each roller. Choose support centers for the conveyor’s legs, if required. 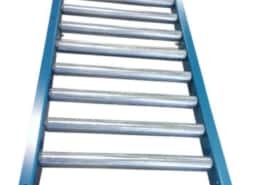 Support must be provided at 5-, 8- or 10-foot intervals for all loads. Review the tables showing the maximum “live” (moving) loads per foot for which the roller conveyor frame is suitable. Remember to count the maximum number of products that will be on the conveyor at once. Finally, make sure the product will move smoothly along the rollers and not get stuck between rollers. Choose the roller center distance (2.5, 3, 4.5 or 6 inches between rollers) so that the product is always gliding on at least three rollers at a time (more if the product is uneven on the lower surface). See the “Downloads” tab on this page for a full catalog and more information. Our staff is happy to assist in analyzing and configuring the gravity conveyor you need. Stationary floor support legs. Click here to see the available range. “Rollers set low” (see graphic). 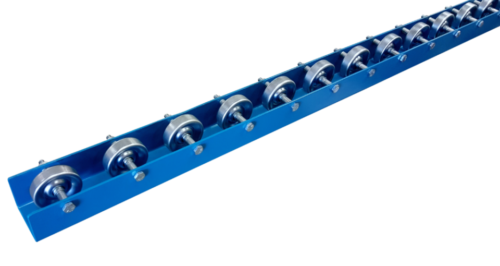 The standard configuration of these conveyors is “Rollers set high” where the top of the roller is above the side of the conveyor frames. 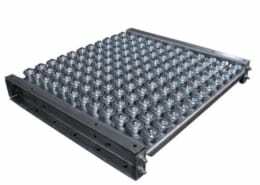 This is to accommodate products that extend over the sides of the conveyor. 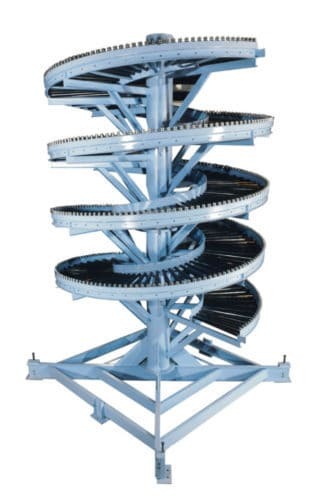 Skatewheel gravity conveyor systems are just like a gravity roller table, except the rollers are “skatewheel” style rollers mounted on axles. This helps convey flat-bottomed items smoothly. 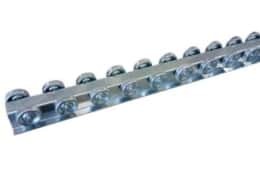 They are generally more economical that gravity roller conveyors, but handle lower loads. 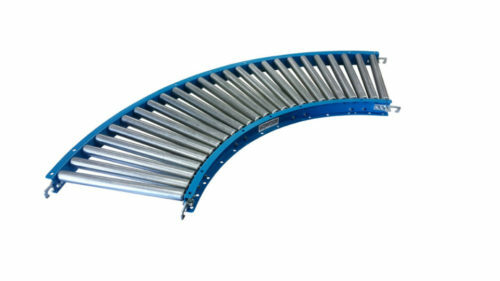 As a result, skatewheel gravity conveyor components are available with steel or aluminum frames in many lengths and widths. 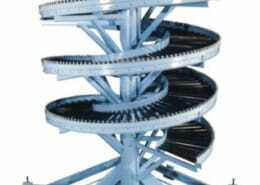 A roller stand also can be made from a gravity conveyor. These systems are very popular when working with sheet material to be fed into or out of cutting saws. 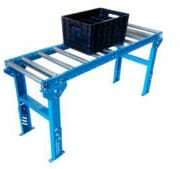 They are sometimes known as roller conveyor tables or roller stand tables. 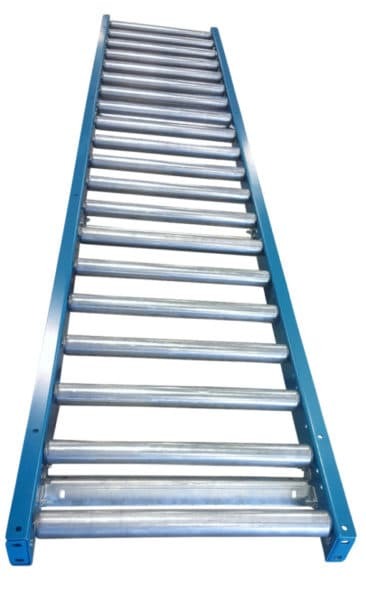 Never stand on or near gravity conveyor Because of the low-friction bearings, you will fall and may suffer serious injury. Because heavy loads may move quickly and continue to accelerate, ensure that any decline sections are carefully configured and tested. 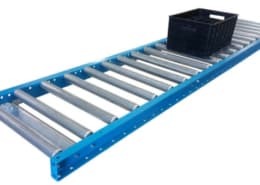 Be careful when creating systems where loads may create pinch points between the load and the rack or conveyor structure. Contact Ultimation at +1-(586)-771-1881 for more design considerations and engineering assistance. Our systems serve some of the largest manufacturers in the world. We’ve designed, manufactured and installed automation equipment and assembly conveyors for facilities of all sizes. As a woman-owned company with more than 30 years of experience in the industry, we’re uniquely suited to address your needs no matter what they may be. We can help you with complete turnkey service from start to finish. Put our extensive expertise to work for you and your facility. For more information about anything we do or to get started on your new conveyor system, contact us to speak to one of our experienced and knowledgeable representatives. 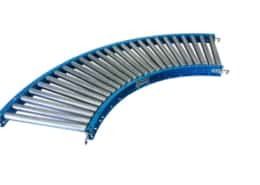 Ultimation is a top-rated roller conveyor manufacturer.